The Islamic State has claimed responsibility for a suicide bomb at a mosque in Saudi Arabia’s Eastern Province on Friday, killing at least 21 people. The on-line statement said “the soldiers of the Caliphate” carried out the attack in the city of Qatif. A photo of the bomber, identified as Abu Amer al-Najdi, was posted. Al-Najdi detonated an explosives belt during Friday prayers at the Ali Ibn Abi Taleb mosque. 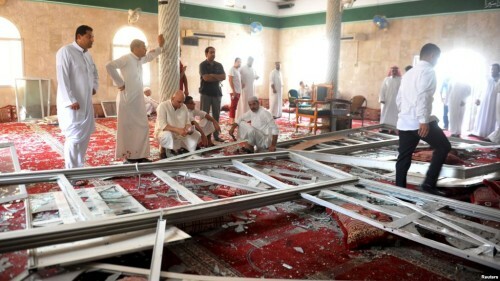 Photos showed bodies strewn across the floor and shattered glass covering the courtyard of the mosque. Saudi Arabia’s Shia Muslims, 10% to 15% of the country’s population, are mainly based in two oasis districts of the Eastern Province — Qatif on the Gulf coast and al-Ahsa, southwest of the provincial capital al-Khobar. The attack was the first targeting the Shia community since November, when gunmen killed at least eight people in an attack on a religious celebration.